Marion Coakes and Stroller, a truly amazing team! In the 60’s and 70’s, if you were a show jumping enthusiast in either England or North America, there was one equine name that got everybody’s attention. In the days before major league sports took over the cable stations and hockey, baseball, and hockey were shown 24 hours a day, the sport of show jumping, especially, in Great Britain had a following that was second to none. These were the decades when top show jumpers wrote books and “annuals” to the delight of their adoring public, company sponsored show jumpers had their company names as prefixes to horse names, and fans wrote for hairs from horse stars’ tails and manes. However, out of this stadium full of the tall, long legged equine show jumpers, there emerged an oddball, albeit, an incredibly talented oddball. A pony named Stroller who was 14.1 h.h. ; a Connemara / Thoroughbred mix that had been blessed by the gods of genetics and the wizards of wonder with confidence and scope. He could jump as high as the world’s finest despite being much smaller…in many cases eight inches shorter than his closest rivals. Stroller was born in 1950 and was initially bought in a job lot from Ireland by a dealer and sold to a Ted Cripps for his daughter until he realized that he might just have a gem on his hands. He sold the pony to Ralph Coakes, a farmer near New Milton, who knew a thing or two about horses and the sport of show jumping. In buying the small pony, Ralph Coakes had just hitched his wagon and his daughter Marion’s even bigger wagon to a star that would explode into a supernova for the next 15 years. 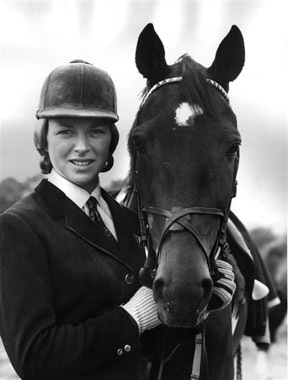 Marion had two brothers, John and Douglas, who were members of the British Show Jumping Team but it was she who had the natural riding talent and ability to bring out the best in her pony. Eventually it seemed that graduating to a horse would be the natural thing to do but Marion knew that Stroller had more to give. They challenged the big horses and the big courses and won over and over again. There was nothing that this pair couldn’t tackle and jump whether it was a parallel, a spread, water, a bank or a ditch! In 1964, this dynamic duo won the Hickstead Derby Trial, a grueling course founded in 1960 by show jumping great Douglas Bunn that tests the best of the best over a course of natural obstacles, a totally different event from the usual colourful stadium jumps. Stroller and Coakes placing second to Seamus Hayes and Goodbye on Derby Day in the actual event. A year later at the age of just 18, Coakes and Stroller won the Ladies World Championship at Hickstead. That same year they won the Queen Elizabeth Cup at the Royal International and won it again six years later. Three years later Stroller was to show what he was really made of when he fought back from a stumble down the big Hickstead bank and achieved the only clear round out of 44 horse and rider teams. Stroller placed second in the Derby in 1968 and third in 1970. In the 1970 Hamburg, Germany Derby, Coakes recalls: “When we sailed over the last fence, having completed the only clear round of the day, the crowd of 25,000 went crazy. It was one of the most exciting moments of my life. We had completed the 50th clear round ever achieved on the course — and it was the first by a woman rider.” Amazingly, Stroller was 20 years old at the time! Stroller also helped Great Britain win three Nations’ Cups, the World team Championships and the President’s Cup. However, despite their wins in regular show jumping classes, Stroller was also a force to be reckoned with in the Puissance classes when height becomes the test for the best. How could this little pony compete against the big guns? He did in 1967 at the Antwerp show and cleared the wall at 6ft 8 in. and dislodged a brick when the height went to 6ft. 10 inches to win the class together with the great Alwin Schockemöhle on Athlet, a puissance specialist. At the 1968 Olympic Games in Mexico, Stroller and Coakes enjoyed their greatest triumph followed by almost near tragedy. In the individual medal competition, they placed second behind American super rider William Steinkraus with Snowbound after going clean in round one and having eight faults in round two. Sadly, troubled by a split and a decayed upper tooth, Stroller was not in top form for the team competition and had the only refusal in his life. He then fell after a second refusal and was eliminated on time. However, the British public still loved their pony and Coakes was named Sportswoman of the Year. In winning this silver medal, she won the first individual silver by a woman at the Olympic Games and Stroller is the only pony to ever have competed in an Olympics. With bad luck behind him Stroller went on to win the Wills Hickstead Gold Medal for points gained in major classes consecutively from 1967 – 1969. 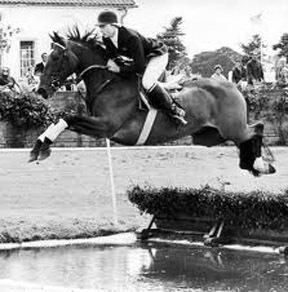 He was also leading show jumper of the year in 1970 and took a first in the Hickstead British Championship a year later. Stroller was retired and enjoyed 15 years of relaxed living before he died at the ripe old age of 36 in 1986. He is buried at Barton-on-Sea Golf Club, New Milton, Hampshire, England, the golf course having bought the Coakes’ Farm for expansion. There is a marker on the course showing his grave. Stroller and Coakes won 61 international competitions, and he is a British Horse Society Hall of Fame Laureate. When we think of top show jumpers like Hickstead, Big Ben, Milton and Idle Dice, we are remembering horses with height on their side. Stroller, a pony, was in a class all by himself and they don’t make them like him anymore. I loved this combination. Stroller was one of my favourite horses. I also loved Anne More and Psalm. Yes, it was amazing how he could jump those huge fences. I never saw him “in person” but I was obsessed with all the show jumpers back then when horse magazines were the only source of info here in Canada. A lot of the info we got came from the British horsey books and annuals…the latter, sadly not written any more! My 2 faves as a young rider was stroller and psalm too. I saw him win the Hickstead Derby and many classes at that venue. I feel privileged to have seen him. What a pony!! Wow…that is amazing to have seen him at Hickstead. I bet every little girl dreamed of being another Marion Coakes and owning a pony like Stroller. It would be interesting to find out what enabled him physically to jump that high….perhaps just being put together in just the right way and having a huge heart. Kudos to the rider too of course! Yes a real one off…..we could use another Stroller these days! I agree about the magazines and books. Pony, Light Horse, Horse &Hound, etc. annuals to go with them. I have all the ones I ever bought or was given ,from when I discovered them whilst living just outside Ottawa “in the ’60s, through moving back to England in 1968 and beyond . Obsessed doesn’t even begin to describe me then. I so wanted to own my own. Came back here and found a lovely stables to ride at. Competent but never confident. Now my daughter has done things I never did. Evented , dressage , showing. An excellent groom, stable manager and rider. There is a great book about Marion and Stroller too. Marion is my 2nd cousin and I have always been a fan of her and Stroller! I would have loved to have seen him in person, amazing pony. She wrote a book called Meet Stroller! I remember them well, and they were my favourites by far. I breed Connemaras now, and some Connie crosses, so maybe there is one out there who will make a name for themselves. It would be presumptuous to call one ‘Stroller’, as he was a one and only ! Much loved ! I met Stroller when the GB showjumping team stayed overnight in the Army stables in Osnabruck, Germany en-route to Berlin, in I think 72 or 73. He was in company with Manhatten, Philco, Sportsman and a bevvy of other famous names that all towered over him, in name only. An amazing little man who inspired everyone who met him or saw him compete. You are so right when you say that they don’t make them like that anymore, the mold was broken after they’d made him. Thank you for stirring a great memory from many years ago!!!! I remember seeing a news film of ‘tiny” Stroller & Marion at the Mexico Games taken from the landing side of a large jump. As the two approached the jump they at one point for what seemed like along time, completely disappeared from sight, all you could see was the jump, then suddenly there they were – up & over. Amazing was an understatement ! Hi Foxhunter: One wonders what this little fellow was made of and how he was put together in such a way as to enable him to jump as he did. Wouldn’t it be great to have another Stroller these days! So lovely to hear about Marian Mould and Stroller and Ann Moore and Psalm – my stomach used to jump every jump with them!!! I was lucky enough to meet marion at the Lincolnshire show I think it was 1969 she was riding daddys girl. I was only 12yrs and I was thrilled when she spoke to me and I told her I had just bought my first pony a black connermara 14.1hands. I loved marion and stroller. STROLLER WILL 4 EVER BE MY HERO, WHEN Y READ THE STORY ABOUT STROLLER, Y STARTED TO BE VERY IMPRESSED,AS Y ALSO HAVE BEEN WHEN HE WAS JUMPING!! I read this piece because I noticed some of Marion’s medals coming up for auction: I saw the name Marion Coakes and immediately thought: Stroller – and wanted to know more. Now I do and what a story! Is his grave open to the public? I would love to go pay tribute to the pony that ruled the world….Sounds like a lot of the same breeding of Teddy O’Conner….the 2nd wonder-pony. I think I may have encountered Stroller’s next incarnation. A New Forest x Thourobred, 14.2 pony called ‘Spotrsman’, bought from similar circumstances (Irish sales) who could jump the roof of the stables if I asked him to. Same white star and lovely temperament in the stable, but a nutter when you show him a jump.. May the spirit of Stroller live on.! Thanks for this paper. Elsewhere, I read that Stroller came from the cross between a Thoroughbred sire and a Connemara pony dam. Is someone knowing the name of his sire? I would appreciate an answer … if possible.